A 2.75 x 1.875 house with round corner full color magnet is generally sought by advertisers such as architects, realtors, and others to promote their brand. This magnet can be easily customized with information such as contact details for a small payment of $0.10. Advertisers who are ordering it in large numbers can always seek them at this rate. 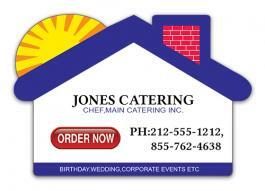 A suitably designed magnet continues to promote the brand throughout lifetime. Product Size: 2.75 in.x1.875 in.